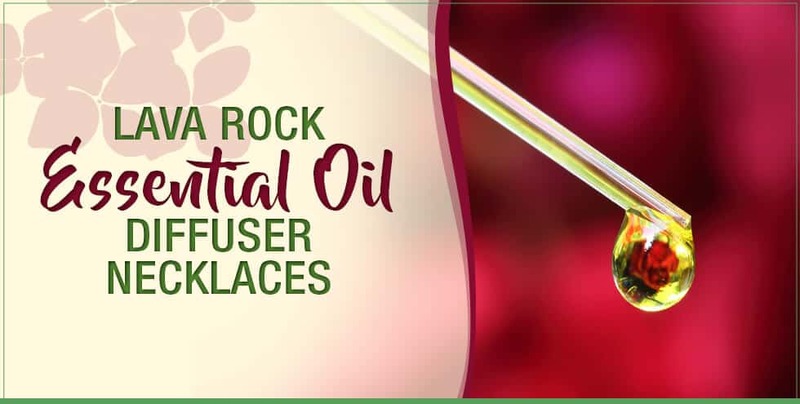 If you’re already looking into a portable aromatherapy solution, then you probably already know the broad range of benefits essential oils have to offer. That being said, due to their numerous benefits finding which oils to use, while also trying to determine the “best” application, is an entirely different story. Suffering from a cold? Apply a couple drops of peppermint to your chest. Or eucalyptus. Or both. Stressed out at work? Diffuse a few drops of lavender on your office desk. Or maybe frankincense. Or, again, both. Having trouble winding down? Diffuse some vetiver and frankincense in your bedroom. 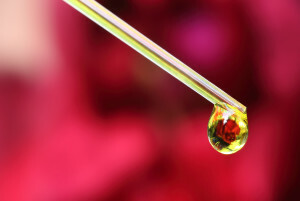 Or combine three or four different oils for a more comprehensive solution. Of course, the question isn’t just what to apply. It’s also how to apply your oils. After all, applications can vary depending on the benefits you are searching for. Up until recent years, “on-the-go” diffusing solutions weren’t readily available. The only way to diffuse essential oils while you were out and about was through topical application. After all, regardless of whether your traditional diffuser has batteries, it’s unlikely that you’d go shopping with such a bulky object. Not to mention, the many raised eyebrows you’d fall victim to. This is why, to meet their portable aromatherapy needs, more people are turning to essential oil diffuser necklaces and other jewelry. 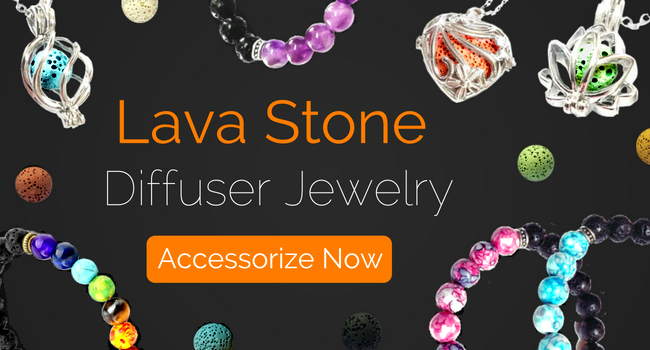 And lava stone jewelry is arguably the most effective solution. Lava rocks are unique in that their porous makeup soaks up essential oils for a prolonged period of time. In fact, depending on which oil you apply, they can hold an aroma for several days. 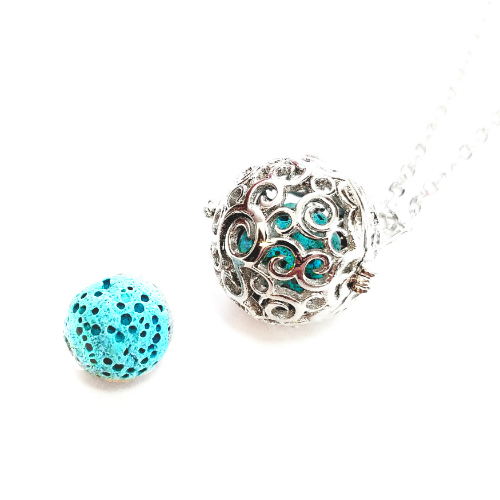 Below, we will highlight our two most popular diffuser necklaces. A more economical option – and our top seller – the eternity necklace is a versatile piece that goes great for any occasion. Its circular, openwork style allows you to diffuse in style, all day long. The necklace comes with one blue reusable stone, and additional stones are available for purchase (a pack of 6 assorted-colored 14mm stones). Learn more about the Eternity necklace here. 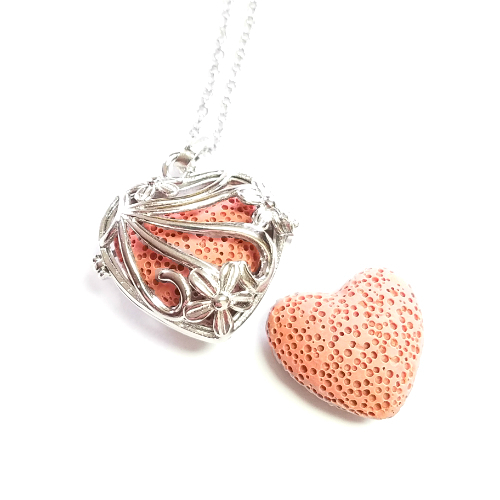 The Floral Heart necklace has a warm, loving style. Combining a heart-shaped framework with a floral design, this necklace evokes personality. The necklace comes with one red, heart-shaped stone, with additional multi-colored stones available for purchase. Learn more about the Floral Heart necklace here. Pour a drop or two of your chosen oil onto the lava stone (multiple lava stones, if you have one of our black stone bracelets). Take the stone and turn it in your fingers until the stone becomes glossy. Unclasp the locket, place the stone in, and then close the locket. 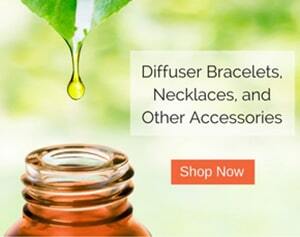 Put on your diffuser necklace and enjoy the therapeutic benefits of essential oils for days! When do you change the lava rock?